If you like your snake skin shoes on the more sophisticated side of the fence. Something that has more of an evening wear look to it but still maintain it's after 8 p.m. look, these red snakeskin loafers can make that look happen. 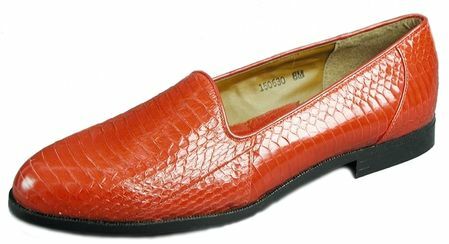 These genuine red snake skin slip on shoes are made by Giorgio Brutini and features a sleek rounded toe style with smoothness baked right in. Checkout the rest of Our Mens Snakeskin Shoes in Different Styles and Colors.